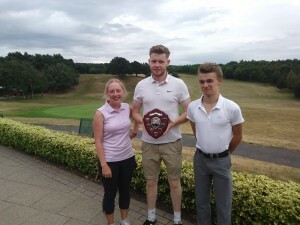 Monday 30th July was Caunton TC annual Golf Day at Rufford Golf Club, it was a soggy morning but the sun came out for a great afternoon of golf. With 3 drawn teams of 3 the ‘clubs where drawn! !’ Overall it was a fun relaxed atmosphere with afew challenging holes and a long, warm walk for some but all in all it was played in great team spirit and everyone enjoyed themselves……..the food afterwards was very much appreciated too! The winning team and walking away with the 2018 Shield were Maria Cotton, James Rich and Huw Brown -WELL DONE! £45 was also raised for the club which is fantastic. Next year we hope that more people will enter……you don’t have to be brilliant at golf, its just for fun!